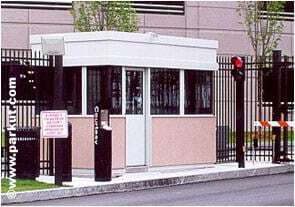 Par-Kut provides the safest and most secure security booths, gatehouses, guard shelters, border inspection booths, security checkpoints and gun surveillance towers to government, private industry, airports and U.S. Military facilities everywhere. 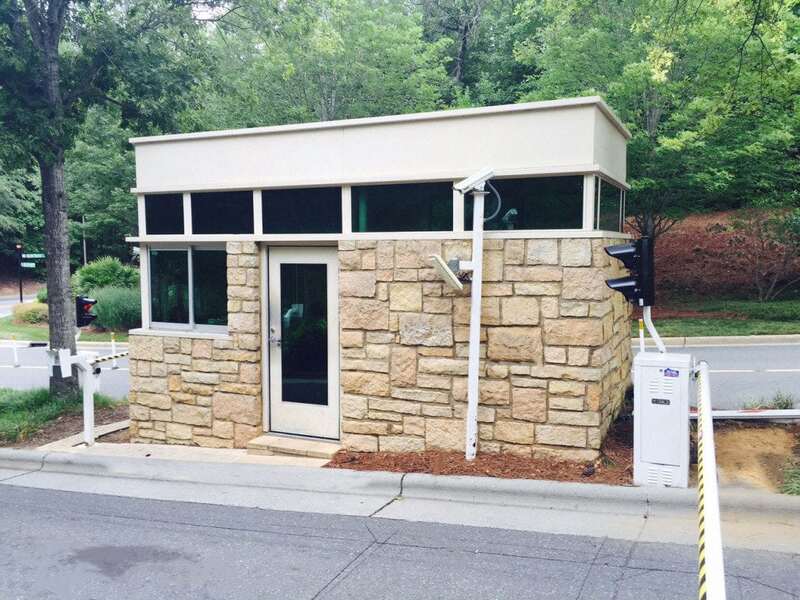 Par-Kut’s all welded steel construction and usage of durable, low maintenance materials ensure the security booth’s greatest longevity. Special security features are offered to customize the building to your location requirements and to keep your security officers comfortable as well as secure. Par-Kut experienced sale persons can assist you regarding our security booth’s security features, or go to BULLET RESISTANT to learn more about Par-Kut’s construction process for hi-risk environments. 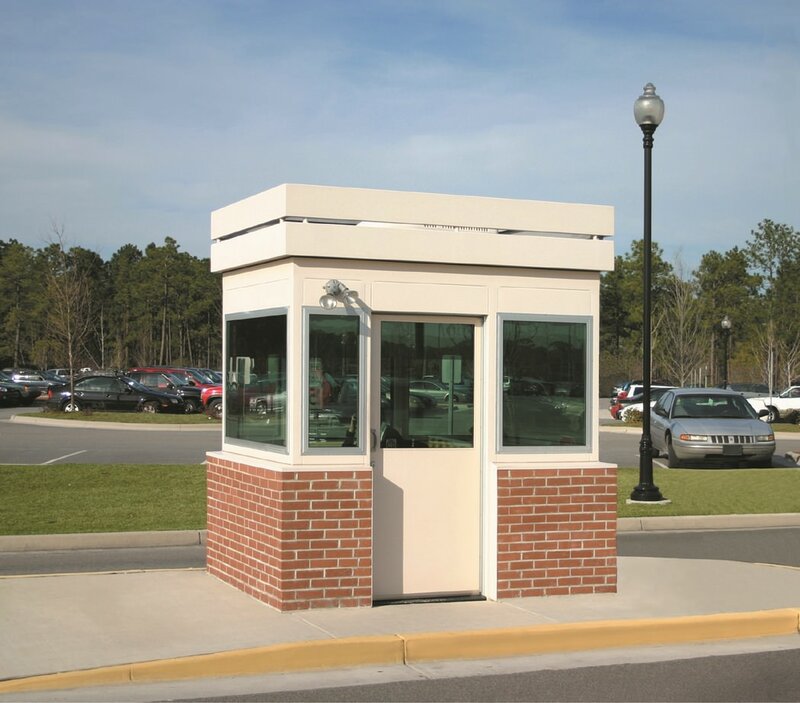 In addition to offering bullet resistant security booths, Par-Kut’s custom manufacturing process allows the customer to specify functional and appearance options that allow the factory assembled security booth to be catered exactly to specific location requirements for traffic flow and architectural look. 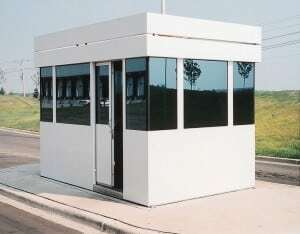 For example if there is traffic on both sides, Par-Kut can include a second sliding door, or if visitors or truck drivers need to enter the Security Booth, a connected lobby for visitors can be added. 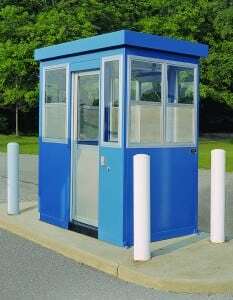 Our sales reps can assist you regarding security booth options. 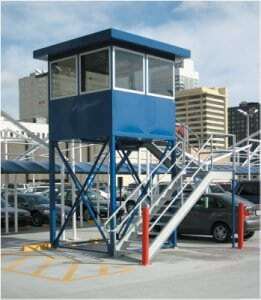 If you need a security booth for sale, our skilled sales person can help. When contacting your Par-Kut professional sales person, please have some information ready for us. In order to make sure that your security booth will pass code requirements we need to know where the booth will be used. So in addition to the type of setting (i.e. 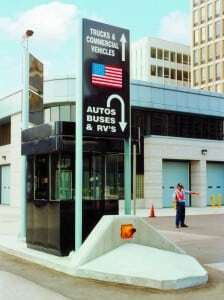 an entrance gate or parking lot), we need to know the city and state. As we build each booth specifically for each customer, you can be positive when we provide a state labeled booth that it will meet or exceed all the applicable building codes. Par-Kut offers drafting and design services in addition to our exceptional manufacturing. 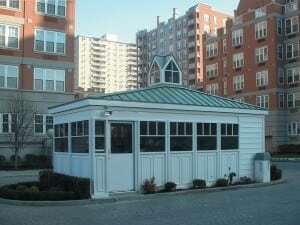 This allows us to design and build you a perfect security booth that looks built in, not bolted on. No matter what the design is, from the most basic to high end design, we will work to utilize our experience to best accommodate your needs. Sliding doors on two or more sides of the building and sliding transaction windows allow for easier interaction with customers and visitors at a facility which helps keep security personnel working at their most efficient levels. 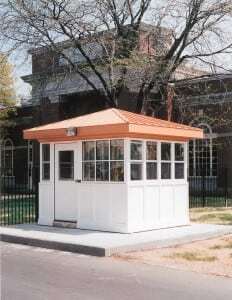 In terms of appearance options, a Par-Kut security booth can include a wide variety of brick veneers, tinted glass, custom roof treatments, multi color paint, colonial style mullions, and more. Owners and security professionals often wish to include CCTV cameras on, or in, their security booth designs. Furthermore, electronic controls for doors are gaining popularity. Both of these things can be prepared for at the Par-Kut factory by including the raceways necessary for each while the guardhouse is being built. All Par-Kut security booth doors, whether standard sliding or optional hinged, include a view window, full weatherstripping, and a key lock. Hinged doors can further be equipped with mortise locksets and/or exit devices. 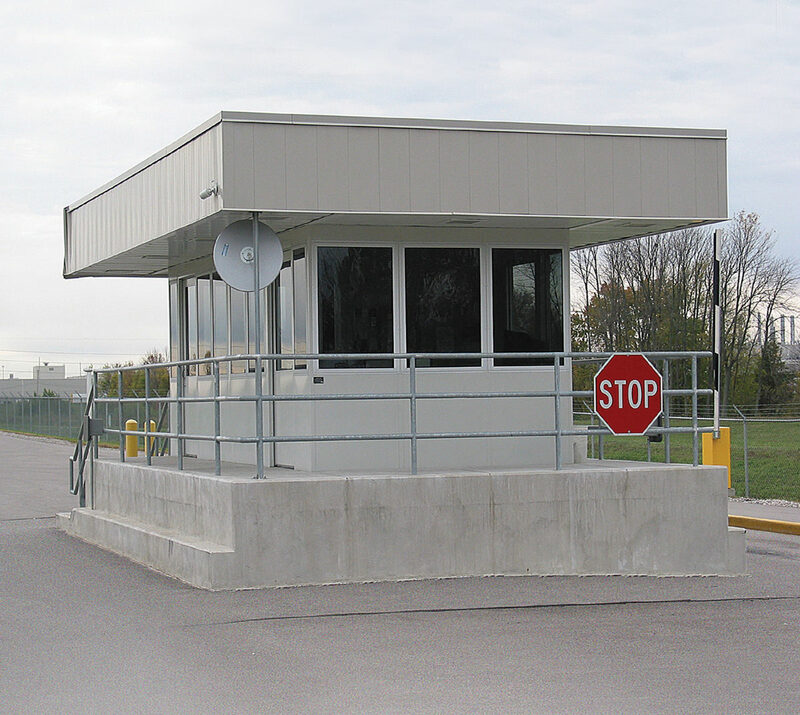 Other important things to consider while specifying and purchasing a factory assembled security booth include compliance with applicable building codes and whether or not the security booth will need restroom facilities. Discuss with your sales person how the states have programs that regulate all types of pre manufactured structures; including portable class rooms, job site construction trailers, cell phone tower buildings, modular homes and security booths and guardhouses. Par-Kut participates in most state programs and can provide quotes for buildings that include the “Gold Label” that certifies your security booth is built in compliance with the applicable codes. One aspect of building code compliance is adherence to the ADA, including restrooms that have disabled access built in. 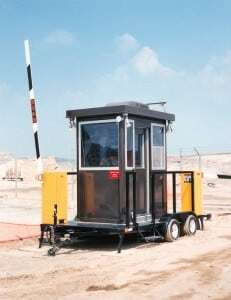 Check with your security booth sales representative in regard to restrooms and code compliance. Give Par-Kut a call or send an e-mail to start the conversation! Go to GALLERIES to view additional Security Booths. Par-Kut provides a security booth used to shelter security personnel. 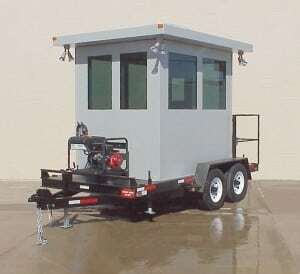 Par-Kut security booths are long-lasting, portable steel buildings.